So I did order a Pencil by 53, and was very excited when it arrived. It’s beautiful (I got the wooden one) and easy to charge. It comes in a lovely and creative package that brought back fond memories of Painter and its paint can packaging. However, once it was charged and ready to go, I had some trouble. At first, Pencil wouldn’t pair with my iPad and I kept getting a message to charge the battery (which I had done). I had left the spare tip at home, so I couldn’t try swapping them out as the app recommended. A colleague tried it with her iPad, and it paired right away, so she unpaired it and I tried again. That time, it worked. I tried to make a list of what I liked and didn’t like. As you see, it’s not up to my usual standards. Some tools work better than others. 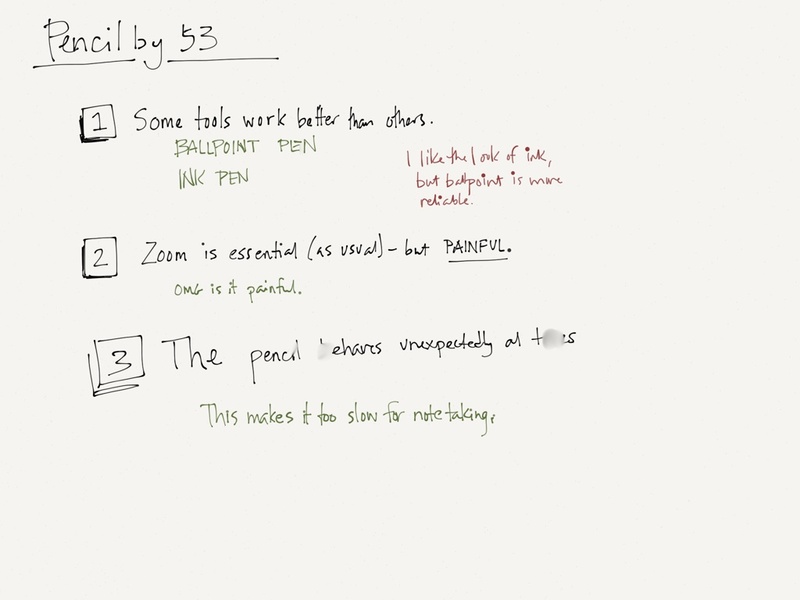 I love the look of the ink pen, but the ballpoint pen is more useful for digital notetaking. The ink pen is harder to control when doing small work like letters. Zoom is essential but painful. The zoom is, for me, the worst part. 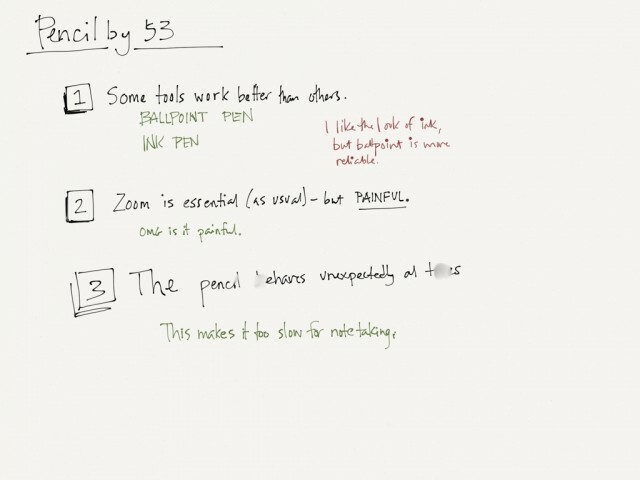 Zoom is critical to writing clearly at small sizes in any app on the iPad. In Paper, I can’t zoom in far enough, and the loupe only allows me to see a small circle of zoomed-in area. I found that using a stylus worked better than using my finger with the zoom, but it was still quite difficult. Pencil behaves unexpectedly at times. Pencil feels great in the hand and looks great lying around, but I can’t say I had a great experience using it with Paper. The squishy tip has to be pressed down fairly hard in order to make the right part of the stylus come in contact with the screen to make a mark, and it’s not always where you expect it to be. Occasionally, it wouldn’t mark at all, or it would behave like my fingertip and smudge the lines instead of drawing new ones. Overall, it was too slow a process for me to comfortably use it to create visual notes. I also tried using my fingertip, which is how I usually take notes. I had trouble with that, too, mostly because of the zoom. The good news: Best palm blocking I’ve ever seen. When you’re using Pencil, you really can rest your palm on the screen and the iPad won’t pick it up. It worked worlds better than other palm-blocking styli I’ve tried. 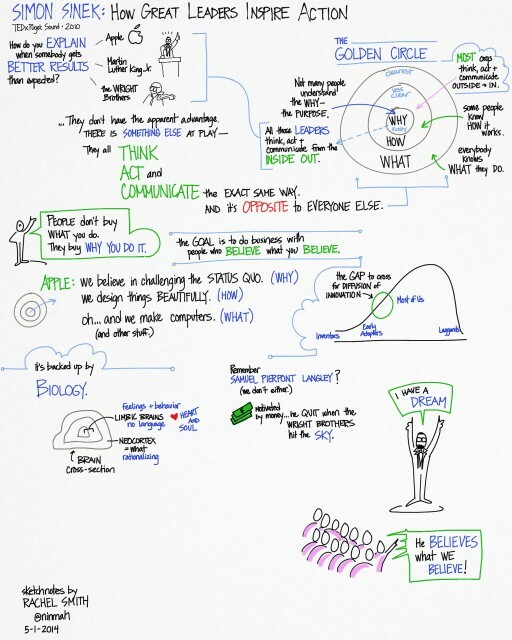 The end result: Not the best choice for iPad note-taking. I love Paper’s interface and I love the look and feel of Pencil. I wish I could love how they function, but they aren’t a great way to take visual notes. Again, for sketching and drawing, I do really like them as a team. Getting people comfortable in a virtual meeting can be a challenge, especially if you plan to use some of the more advanced features of your web conferencing tools. Even if that’s not in your agenda, it’s helpful to have folks take a minute to check in once the group has assembled. You’re familiar, I’m sure, with the awkward-silence-and-simultaneous-speaking method of going around the virtual room. How about trying a visual alternative in your next meeting? This one was shared with me by a student in one of my digital facilitation workshops. The check-in grid is a quick, easy and fun way to avoid the awkward stumbling while still giving everyone a chance to have his or her voice heard. 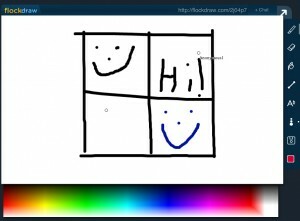 It also lets folks experience the group whiteboard feature of a web conferencing tool during a safe and low-stakes activity, so that later, when you ask them to dot vote or contribute to a group visual, they aren’t totally lost. 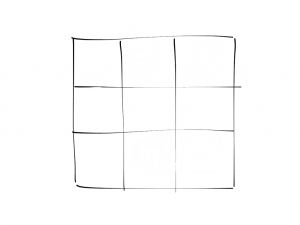 Start by drawing a grid on the collaborative whiteboard that has at least enough squares for each person to have one (including yourself). You can do this in advance of the meeting, or while people are gathering in the call, or right after you call the meeting to order when everyone is present. • …how you are feeling about our progress so far. • …how you are feeling right now about the issue we have come together to discuss (name the issue so it’s clear). • …how your weekend went. And so on. Explain that there will be a little pandemonium for a moment as people sort out which square to use. Point out that there are enough for everyone, so if two people start to use one square, one of them should just choose a different one instead. 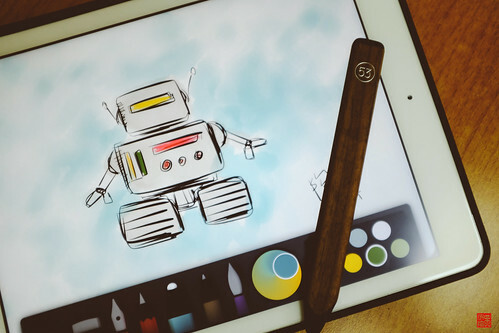 Show people where the drawing tools are and how they work, if they don’t already know. You can invite everyone to make a test mark outside the grid if they want to practice. When everyone is ready, tell them to go ahead. Let them sort out the squares themselves – it’s a mess at first, but it will work out. It’s okay if they talk. 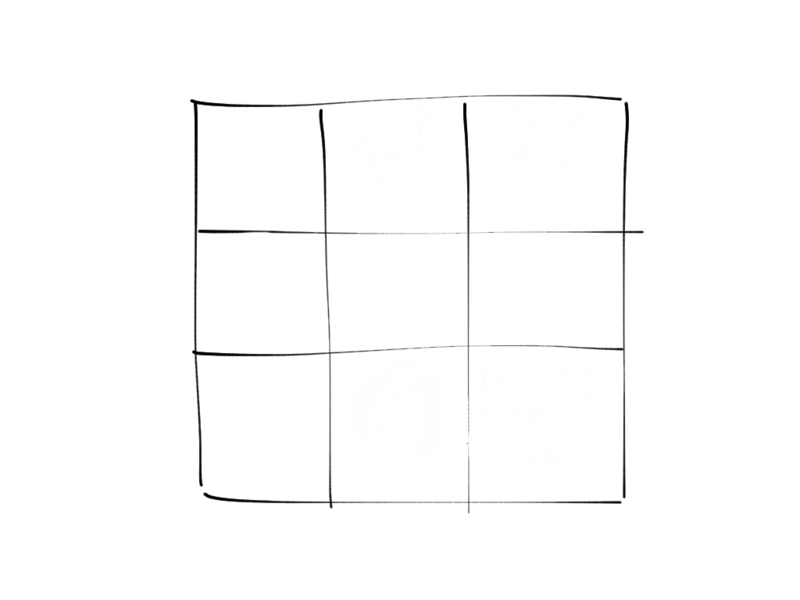 Wait until it looks like most people have chosen before drawing your own image in an unused square. Makes you want to know what’s up with the cat person, doesn’t it? When everyone has finished, start at the top left and go along the rows. Ask each artist to identify him or herself and say something about why they chose to draw what they did. Acknowledge each person’s contribution. There you go! You’ve given everyone a chance to speak and share something about themselves, and you’ve established a speaking order that you can use throughout the meeting to help avoid talking over one another. 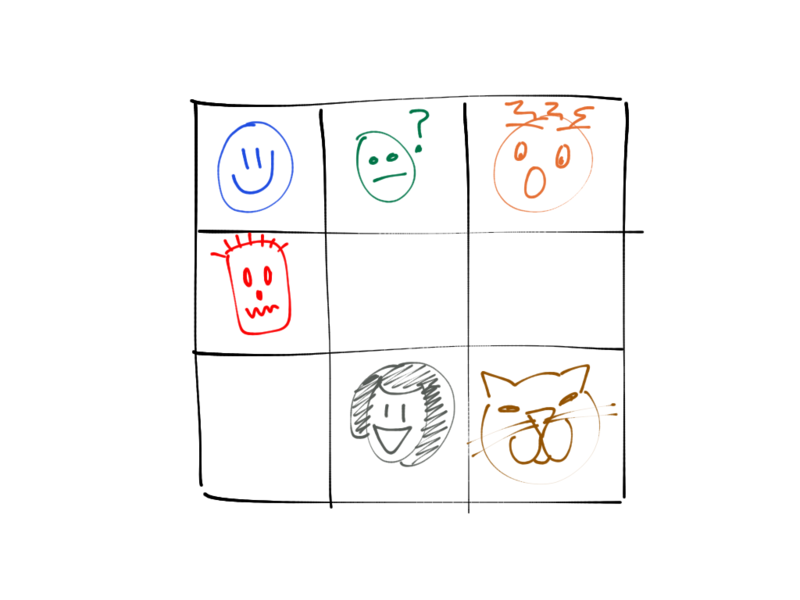 Once everyone is done drawing but before you go around for the verbal check-in, take a screen shot or download the image, open it in your drawing program, share your screen, and graphically record everyone’s remarks around the outside of the grid. Only do this if you can manage it very smoothly and quickly, or you will lose the good energy built up by the drawing. No collaborative whiteboard? No problem! Alternative #1: Ask everyone to draw a quick face on a scrap of paper, take a photo with their phone, and either upload it to the web conferencing tool (if that’s easy) or email it to you right away. Flip through the uploaded drawings in the web conference, or share your screen and open them one by one on your computer. Have each person explain as above. 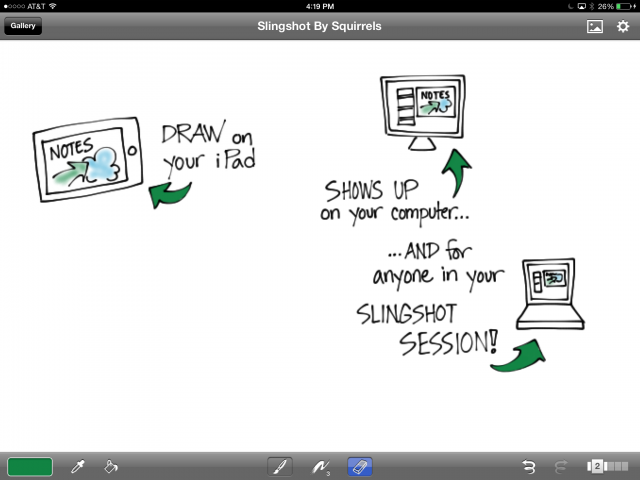 Alternative #2: There are a lot of free shared whiteboarding tools that you can use for your meeting. Flockdraw is one. 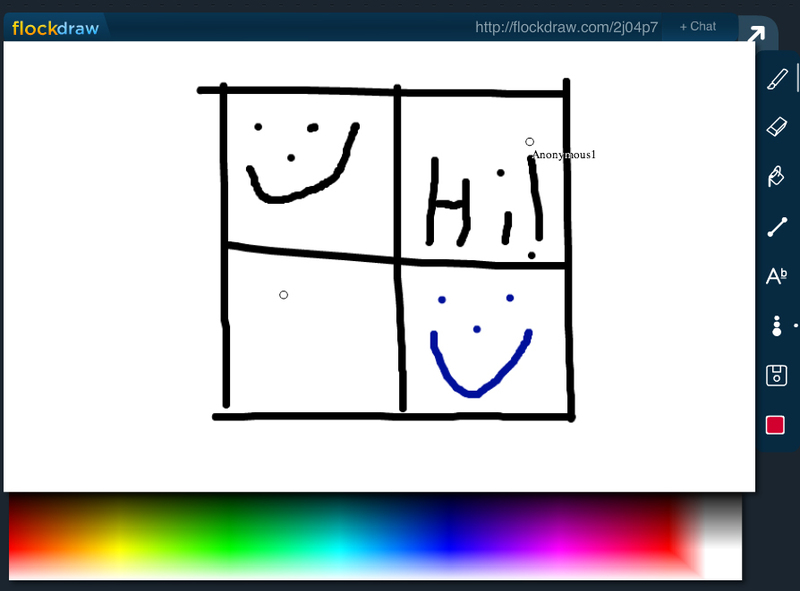 You just create a whiteboard and share the link, and everyone can draw together using its incredibly simple interface. There are many other options too — just keep searching until you find one that you like. A co-conspirator and I created this in about fifteen seconds on our first Flockdraw visit. Alternative #3: Instead of drawing a face, everyone can use the whiteboard type tool to write one word that describes how they are doing (or answers whatever question you have asked them). Give it a try — let me know how it goes! Posted in everything. 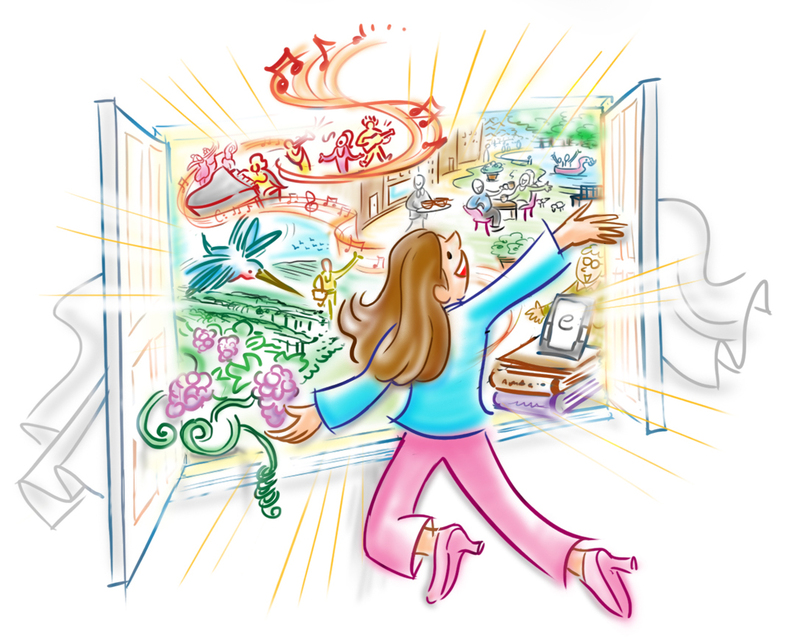 Tagged with facilitation, graphicrecording, howto, tools, virtualmeetings, webconferencing, webex. I laughed. Then I cried. Many of my colleagues had similar reactions. The video points out some of the common events that make so many online meetings so incredibly dysfunctional: ineffective introductions, bad audio, people talking over one another because of a lack of visual cues, and of course the Technology Factor. We have a lot of skills for coping with these issues in face-to-face meetings, but we’re still working out the promising practices for handling the same issues in online meetings. Throw in some technology tools — which sometimes work and sometimes don’t — and a group of people who have different kinds of equipment and different levels of comfort and skill with the tools, and you’ve got a situation that is uncomfortable at best and disastrous at worst, especially for the meeting facilitator. 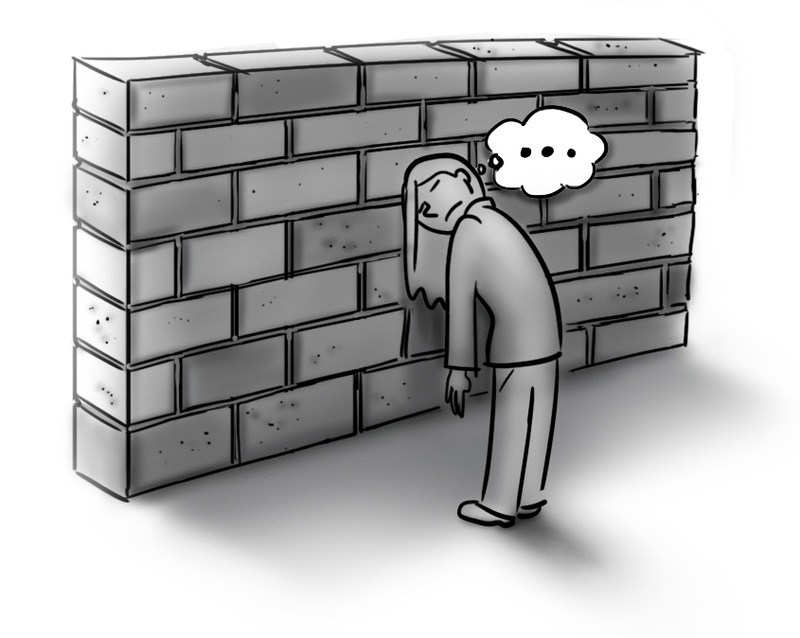 We’ve all been that guy out in the hallway, talking to the wall, slowly realizing that no one else can hear us. The good news is that the tools are growing simpler and more cross-platform. Enterprise-level tools that have been around for a long time in terms of Internet timeframes (think WebEx and similar systems) are evolving, and new tools are emerging (think Join.Me and Skype and so on). Instead of requiring special plug-ins or client versions of the software or different setups for different operating systems, the tools are being adapted to work on any platform, be it PC, Mac OS, or the different mobile flavors. The users of the tools don’t need to do as much to make them work, because the tools are becoming more flexible. More good news is that we’re developing methods to cope with the social aspects of online meetings regardless of the technology we’re using. Not everyone can manage multi-party video calls — although that’s getting cheaper and easier too — so we’re working out ways to handle basic interactions like introductions, orientation to the meeting purpose, and conversations that lead to real work, even when you can’t see your colleagues. Visual methods that support these interactions can be employed without much special equipment at all, and the payoff in terms of lower frustration, greater efficiency, and higher engagement is huge. So go ahead and laugh at the poor folks in the video. Then think about which of those painful moments you encounter the most — and how you can address that one issue in your next online meeting. I’d love to hear your ideas… and I’ll share some of mine too. Let’s make awkward online meetings a thing of the past. Posted in everything. Tagged with conferences, facilitation, virtualmeetings, webconferencing, webex. What’s with all the words? The other title I considered for this post is Only You Attend the Meeting in Your Head. This is about two related questions that I get from time to time. From prospective clients or people who are curious about visual practice, I hear: “How do you decide how to balance text and images in your work?” From fellow practitioners, I hear: “My client asked me to record using only pictures. Got any advice?” Advice? Maybe. Opinions? Always. Read on. David Sibbet recording reflections at IFVP 2008. The whole group can glance over and see the chart as he creates it. 2a. 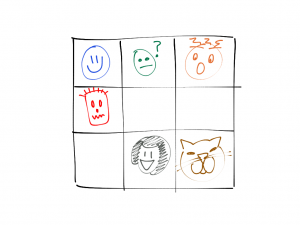 For a discussion, this means that related ideas are grouped or linked visually, even if they are expressed at very different times in the conversation. Important or repeated ideas are highlighted somehow. Group agreements are clearly indicated. In other words, the graphic recorder helps organize and annotate the group’s thinking. At Elliott Masie’s Learning 2013, where I remotely captured a series of plenary interview sessions this week, this was described as ‘curating,’ a term I like. Color, shading, and placement indicates related concepts. 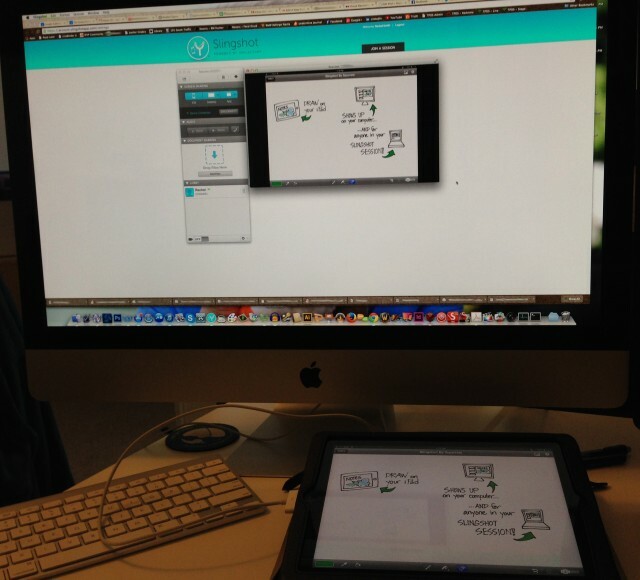 Remotely digitally recorded for Elliott Masie’s Learning 2013. Some key points, important concepts, evocative moments, or relationships between ideas are annotated or captured with images as well as, or instead of, words. Notice that the pictures part of ‘visual’ is way down in #3. I did that on purpose because in my practice, I emphasize #1 and #2. So here’s the thing with that. 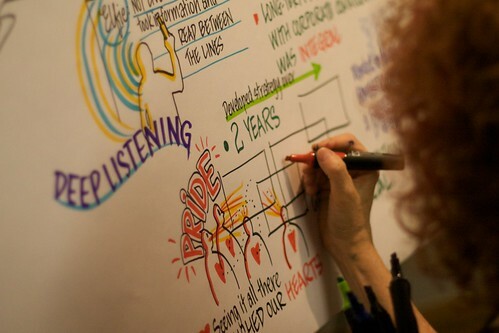 The first rule of graphic recording is this: Capture the speaker’s exact words. There are two reasons to do this. One is that the speaker will only understand he has been heard when he sees his own words written down on your chart. The second reason is that there are always two meetings going on: the one in the room, and the one in your head. The only experience that you can guarantee everyone is having is the one that is happening there in the room. The only person attending the meeting in your head is you. (Honest.) If you change the speaker’s words, even if you are interpreting or paraphrasing, you are recording the meeting in your head, which no one but you is attending. If you use only pictures to capture the discussion, you are interpreting everything. Pictures can enhance understanding only if the context is clear. Without the shared context of the words, the meaning is apt to be lost, and when participants review the charts after the meeting they will not recall as much as they would if you had also captured some of the exact words they heard in the room. There are very, very few universally recognized images, and they generally communicate very simple concepts — not the complex ideas and relationships between them that are the substance of a facilitated working session or a really good presentation. When a client asks me to record using only images, I try to get a little more information about what they want to do with the finished work — what their outcomes are. If they want the piece to remind people of the conversation and be a resource for future discussion, it’s critical for the words people actually heard to show up in the chart. If they are looking for a commemorative mural to frame and hang as a work of art, I happily direct them to other practitioners who will give them something much more in line with what they are after. It’s not wrong to want that as an outcome. I’m just not the best person to deliver it. There are many, many flavors of visual practice, and many applications for the different approaches. Just like any other method or tool, some applications are a better fit with some approaches than with others. Match your tools and methods to your outcomes, and you’re golden. 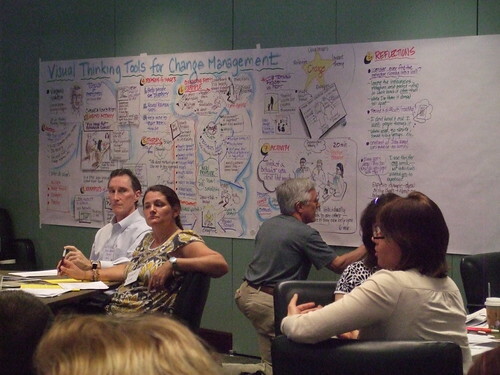 * If I’m doing graphic facilitation — working directly with the group as opposed to working only with the chart while another facilitator handles the process and group dynamics — my charts are often not, strictly speaking, beautiful. I’m okay with this. The information is there, and it’s organized, and people can read it. When I’m doing straight graphic recording, I go in for beauty a bit more. I also know some wonderful practitioners who achieve beauty at very high levels no matter what their role. Posted in everything. Tagged with graphicrecording, visualpractice. There are many stories to tell about Doug Engelbart. He touched so many lives, and many stories are being told right now, in remembrance and celebration. There are stories about the invention of the mouse. Stories about his early work at SRI on packet switching. And of course, stories about the Mother of All Demos. I have a story about him, too, but mine isn’t about any of those events. My story takes place at a cocktail party in Menlo Park, about four or five years ago. 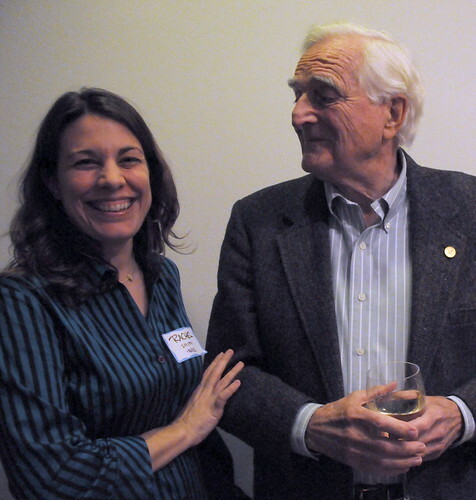 Rachel Smith with Doug Engelbart. Photo by Larry Johnson. At the time, I was vice president of services for the New Media Consortium (NMC). We were participating in a jointly-sponsored event to commemmorate the 40th anniversary of the Mother of All Demos called the Program for the Future. We heard panels and talks, gave a talk about NMC, and saw a screening of the Mother of all Demos. Many of my technology heroes were there. It was a bit like being in the presence of royalty, or miracle workers, or both at the same time. It was dazzling and awe-inspiring. In the evening, we attended a cocktail party at the home of one of the organizers. I was standing with a group that included Doug, chatting and exchanging our favorite mobile apps, completely amazed to be having this normal coversation (well, normal for techies, I guess) with such incredible people. Suddenly, my attention was distracted by an abrupt noise from the room behind me. I half turned to see what it was, and while I was looking away, I felt a swift, gentle yank on my ponytail! I turned quickly back and saw astonishment and the beginnings of amusement on every face — except Doug’s. He was wearing an expression of the most perfect innocence, for all the world as though he were absorbed in thought. I had no idea what to do — laugh? object? pretend nothing had happened? Then he gave me the tiniest possible wink, and I couldn’t help it, and I burst out laughing. He grinned like a schoolboy. My story of Doug Engelbart is that moment: that instant when I understood him as more than the passionate, brilliant inventor and thinker he undoubtedly was. My story is that playful moment, the moment when Doug Engelbart pulled my ponytail and pretended he hadn’t. Posted in everything. Tagged with nmc, storytelling.